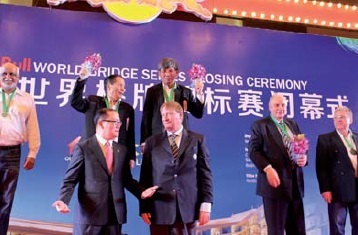 The event, as Paribas World Senior’s Pairs, was instituted in 1990, when the 8th edition of the World Bridge Series took place in Geneva, Switzerland, Alan Hiron and Albert Domer from Great Britain, were the first champions. 1. Marc Jacobus – Mike Passell (USA). 2. Apolinary Kowalski – Jacek Romanski (Poland). 3. Mark Itabashi – Eddie Wold (USA). 1. Henky Lasut, Eddy M F Manoppo (Indonesia). 2. Hemant Lall, Reese Milner (USA). 3. Apolinary Kowalski, Jacek Romanski (Poland). 43 Pairs entered for the Seniors Pairs Championship. 1. Rich Demartino – Patrick McDevitt. 2. Kyoko Ohno – Akihiko Yamada. 3. Farid Assemi – Edward Wojewoda. 1. Nico Klaver & Roald Ramer. 2. Julian Klukowski & Aleksander Jezioro. 3. Entscho Wladow & Reiner Marsal. Senior Pairs for the Hiron Trophy attracted a field of 103 pairs. The event was a fourday eight-session play through, with the winners earning the Hiron Trophy. 1. Christo Drumev – Ivan Tanev (Bulgaria). 2. Bruce Gowdy – Arno Hobart (Canada). 3. John Mohan – Claude Vogel (USA). 72 pairs entered the Senior Pairs. 1. Boris Shapiro – Irving Gordon (Great Britain). 2. Lea Dupont – Benito Garozzo (USA). 3. Burghard von Alvensleben – Walter Höger (Germany). 100 pairs entered the ELF Senior Pairs. 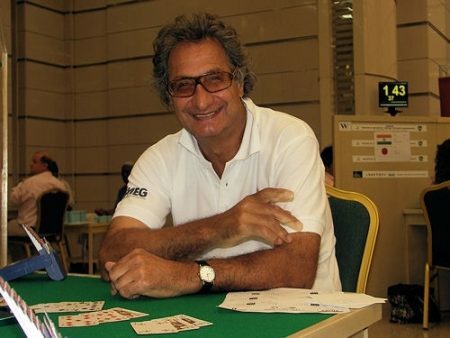 An amazing performance from Boris Shapiro (picture), aged nearly 90, clinched the championship for the British pair. 1. Hamish Bennett – Fred Hamilton (USA). 2. Simon Kantor – Murray Melton (USA). 3. Duncan Philips – Bill Solomon (USA). 78 pairs entered the NEC Senior Pairs. The Paribas World Senior’s Pairs was won by Alan Hiron and Albert Dormer (Great Britain).